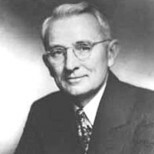 Dale Carnegie was a best-selling author, prominent lecturer, and sought-after counselor. Born in 1888 in Maryville, Missouri, he was devoted to public speaking from his teenage years. An aspiring actor and unsuccessful salesman, he moved to New York City and began teaching communications classes to adults at the YMCA. In 1912, the world-famous Dale Carnegie Course was born. After serving in the army in World War I, Carnegie turned to a tour to promote his ideas about success through public speaking. In 1936, he wrote How to Win Friends and Influence People, which became an immediate success and one of the biggest sellers of all time. He also authored the bestseller How to Stop Worrying and Start Living. Over 50 million copies of Carnegie’s books have been printed in 38 languages. In demand as a lecturer and writer, Carnegie began a syndicated newspaper column, had his own daily radio show, and organized the Dale Carnegie Institute for Effective Speaking and Human Relations with branches all over the world. Carnegie was convinced that it is never too late for people to realize their full potential. Dale Carnegie Training has helped individuals become successful professionals for nearly a century. Its courses, like The Dale Carnegie Course, enable people to move beyond their comfort zone and achieve real performance improvement. Its programs encourage interaction and participation. • You can make more friends in two months by becoming interested in other people than you can in two years by trying to get other people interested in you. • You have it easily in your power to increase the sum total of this world’s happiness now. How? By giving a few words of sincere appreciation to someone who is lonely or discouraged. Perhaps you will forget tomorrow the kind words you say today, but the recipient may cherish them over a lifetime. • Be more concerned with your character than with your reputation. Your character is what you really are, while your reputation is merely what others think you are. • The man who goes farthest is generally the one who is willing to do and dare. The sure-thing boat never gets far from shore. • Are you bored with life? Then throw yourself into some work you believe in with all your heart, live for it, die for it, and you will find happiness that you had thought could never be yours. • Remember, happiness doesn’t depend upon who you are or what you have. It depends solely upon what you think. • If you want to win friends, make it a point to remember them. If you remember my name, you pay me a subtle compliment; you indicate that I have made an impression on you. Remember my name, and you add to my feeling of importance. Dale Carnegie is best known for his book, How to Win Friends and Influence People, so this is the perfect place to get started. I believe this book defines him and is the reason that he is a household name in the Self Improvement Industry. If you haven’t read it, go out and read it today. It should be a part of every Self Improvement library. How to Win Friends and Influence People is as useful today as it was in the 1930s because Dale Carnegie had an understanding of human nature that will never be outdated. A complete industry has sprung up around it. The book emphasizes the importance of being able “to express ideas, to assume leadership, and to arouse enthusiasm among people.” Carnegie also emphasizes fundamental techniques for handling people without making them feel manipulated. If you want to gain the full Dale Carnegie experience, I would suggest contacting one of the Dale Carnegie Training offices in your area and signing up for the Dale Carnegie Course, or any other public speaking programs they offer. Through the use of public speaking, the Dale Carnegie Course teaches you how to communicate more effectively and can help you increase your confidence tremendously. Visit www.dalecarnegie.com for more information.